"Let me be born a Hmong again, so we can love each other all over as we did during my lifetime." 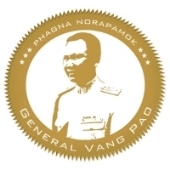 General Vang Pao, June 2010. "Vang Pao was naturally intelligent, an expert guerrilla fighter. That's why I sought after him." Colonel James W. Lair, June 2011. Nai phoo vaj pov cov lus kom hmoob koom tes.